President Kennedy's mission in 1961 to reach the moon culminated in the successful voyage of the Apollo 11 spacecraft in 1969. The exploration of space and the efforts of the National Aeronautics Space Administration (NASA) to accomplish this objective exerted a powerful influence on the decade. This was formidably demonstrated in 1964 at the New York World's Fair, where the United States government had a Space Park with exhibits that included a full-scale model of the Saturn V rocket. The primary theme of the fair was Peace Through Understanding, but another that referred to space exploration was added: Man's achievements on a shrinking globe in an expanding universe. Walter Dorwin Teague's design for the fair's visual symbol, Journey to the Stars, which was rejected, reflected the latter. Ultimately, a huge 140-foot-high spherical steel armature, an open grid of meridians and parallels with superimposed shapes of the continents that was encircled by three rings representing the first man-made satellites launched into space, was chosen and named the Unisphere. Although the American Craftsmen's Council did exhibit photographs of the work of five craftsmen, among them John Prip, International was the sole silverware manufacturer displaying its products at the fair. 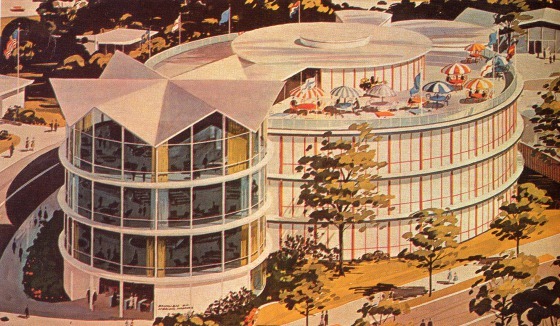 International's exhibit was installed in the Pavilion of American Interiors, a four-story building on the Avenue of Progress devoted exclusively to home furnishings. The dazzling Moon Room, inspired by the possibility of interplanetary space travel, was the highlight of International's exhibit. 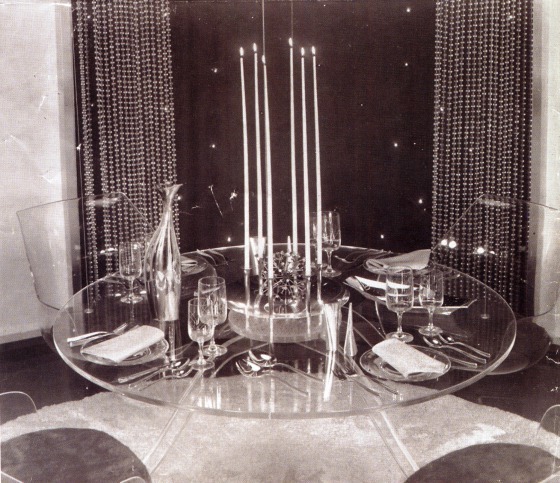 The focus of the display, designed by the New York firm of Ellen Lehman McCluskey, was the suspended table and floating chairs of clear plastic, which were bathed in lighting to suggest twinkling galaxies. The custom-made holloware for the Moon Room, almost all sterling silver, was the company's in-house tour de force. Robert J King, who started at International in 1962 after leaving Towle, where he had designed Contour, was the designer of the Celestial Centerpiece, a circle of six candleholders enclosing a brilliant silver "flowerburst" tipped with 133 spinel sapphires. King also designed a pair of tapered conical candlesticks with blue enamel trim and a pair of five-light candelabra with spherical elements to evoke the planets. The Nova tureen with matching spoon by Milton Gonshorek and the Venus water pitcher by Edward Buchko were displayed in wall niches. So, too, was the Lunar coffee service designed by Stuart Young (b. 1924) in an experimental three-sided form unique in American post-World War II industrial silver. Like Gorham's Cubic service by Erik Magnussen in the 1920s, the Lunar service was a showpiece prototype that was either too avant-garde or too expensive to put into mass production. Although the shape of the pouring vessels of the Lunar service may recall to some the triangular iced-water jug by Sigvard Bernadotte for Jensen, which was illustrated and listed erroneously as a coffeepot in the catalogue for the Design in Scandinavia exhibition in 1954, Young's design differed in significant ways. The elongated spout of his pot is an independent element; the spout of Bernadotte's jug is integral; the Lunar handle is angled and faceted; Bernadotte's handle is vertical and rounded; the Lunar has an angled and faceted finial; Bernadotte's jug has none; the Lunar has a recessed base, Bernadotte's piece has no base. Moreover, the edges of the triangular Lunar are crisp folds in contrast to the fluid curving edges of Bernadotte's jug. A more likely and important source of inspiration for the coffee set and other pieces in the Moon Room would have been the annual Sterling Today competitions sponsored by the Sterling Silversmiths Guild of America (a trade association of silver manufacturers founded in 1919). The competitions encouraged innovation by students and craftsman and recruited potential designers for the industry. Buchko, for example received an award in the first competition in 1957 and King received awards in 1957 and 1958. The carafe on the Moon Room table was, however, made independently by King in the early 1950s, but it fit the theme and was deemed an appropriate addition. No doubt, its voluptuous biomorphic shape was a factor. The Vision pattern, also designed earlier, was similarly selected as the Moon Room flatware. The designer of Vision was the metalsmith Ronald Hayes Pearson (1924-1996), a finalist in the 1960 International Design Competition for Sterling Silver Flatware, and the prototype was produced in 1961 by International. The name given to the pattern was indeed visionary and may have been inspired by Kennedy's vision that year of reaching the moon. Jewel Stern, Charles Venable and Kevin Tucker, ed. Modernism in American Silver: 20th Century Design. (New Haven: Yale University Press. 2005.) 264-267. In a 1964 advertisement for International Silver Co. in the New York Times reassured customers, "Another thing about our Moon Room. It lets those scientists know no matter what we'll be eating 20 years from today - even if it's little blue food pills - dinner will still be served on gleaming silver platters. By candlelight."